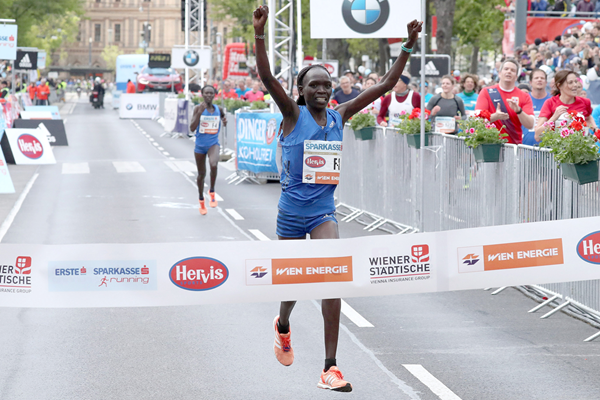 Nancy Kiprop will return to defend her title at the Vienna City Marathon on 22 April, facing one of the strongest women’s fields ever assembled for this IAAF Gold Label road race. This year’s race, its 35th edition, features four women who have run under 2:25, Kiprop among them with a 2:24:20 lifetime best. The Kenyan prevailed in a thrilling battle last year, propelled by that personal best to win by five seconds. It was the closest women’s finish in the history of the event. “Without the wind I think I could have run 2:22,“ Kiprop said. Despite the conditions, she ran the second fastest time ever recorded in the Austrian capital. Italy’s Maura Viceconte set the course record of 2:23:47 in 2000. She may have to run even faster to defend her title. Kiprop celebrated her 38th birthday last year, but a 1:07:22 half marathon personal best in Usti nad Labem, Czech Republic, in September suggests there’s still plenty of speed left in her legs. Prior to that race, she’d never run under 1:10:00 over the distance. Three other entrants have run faster marathons than Kiprop. Among them is Helen Tola who has illustrated very good form on two occasions during the past six months. In September, the 23-year-old Ethiopian lowered her marathon best to 2:22:51 in Berlin, finishing fourth. In February she clocked 1:07:47 at the Ras Al Khaimah Half Marathon, a two-minute improvement over her previous best. ”I want to go for the course record,“ Tola said. ”With the help of pacemakers I hope to break it"
Fatuma Sado is another runner from the Ethiopian ranks who should be considered among the favourites. The 26-year-old has a lifetime best of 2:24:16 and has several international marathon titles to her credit, including Warsaw in 2015, Beijing in 2014, Los Angeles in 2012 and Hamburg back in 2011. She also prevailed in her most recent appearance, winning January’s Xiamen Marathon in 2:26:41. Others to watch include Bahrain’s Merima Mohammed, who boasts a 2:23:06 lifetime best set in 2010. Most recently, she was sixth in Frankfurt last October, clocking 2:27:49.